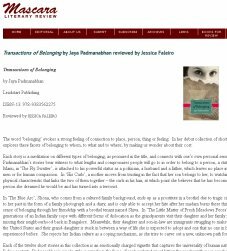 "In this debut collection, Jaya Padmanabhan has brought together a diverse and memorable group of characters from many kinds of backgrounds. With meticulous details and keen observation, she brings them to life and makes us care about them - their poverty, their loneliness, their tragedies and their triumphs." "Mustard Seeds is a big story. It’s packed full of emotions and images. This gives it the feel of a tapestry and from the start the soulful writing drew me in and I wanted to savour and explore the story." "This is a story about the utter destruction of a family because of their political beliefs. I appreciated its temporal balancing act - suspending the story in a single present moment while simultaneously revealing the protagonist’s past and gesturing toward his certain, irreversible future. The theme of fire is a smoldering presence throughout." "We had a remarkable number of submissions written in 1st person, and I found that this story showcased the best that perspective offers: it sustains a compelling and original voice." "Another excellent story, a saccade of epiphanies ‘limned by light and shadow’, delightfully woven in exquisite language! The flashbacks and present-time reflections merge into a prose poem that conveys a depth of poignant feeling." "A chilling and beautifully crafted tale! The pacing of each paragraph is immaculate. The perception is deep and compelling. The emblem of the kitten as a metaphor for the lost innocence of the son is well developed." 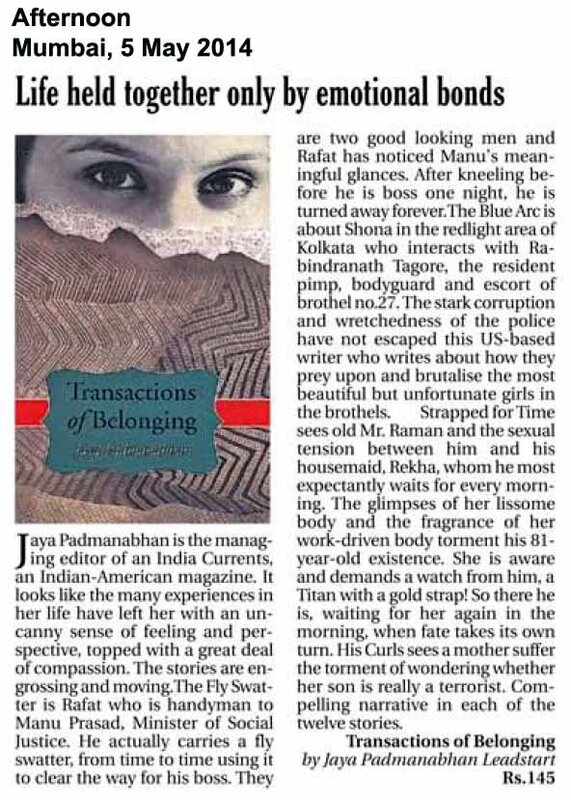 Jaya Padmanabhan's debut short story collection Transactions of Belonging was published by Leadstart Publishing yesterday. 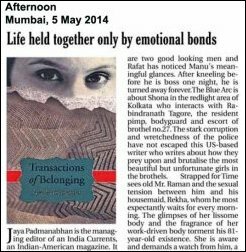 I met Jaya when we took a fiction workshop together in 2009 and was immediately impressed with her talent. The stories she submitted were intense, powerful and memorable. Jaya is the managing editor of the widely circulated Indian-American magazine India Currents (in the interests of fair disclosure: I contribute to India Currents). She is also a generous and observant nonfiction writer. Novelist Chitra Divakaruni noted the diverse cast of characters in Jaya's collection, writing, "With meticulous details and keen observation, she brings them to life and makes us care about them - their poverty, their loneliness, their tragedies and their triumphs." 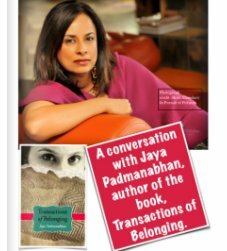 Jaya will read from Transactions of Belonging on May 11, 2014 at 4 p.m. at Know Knew Books. 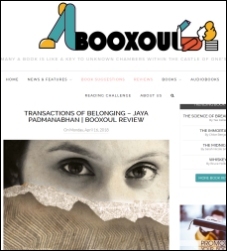 Transactions of Belonging is an evocative title. 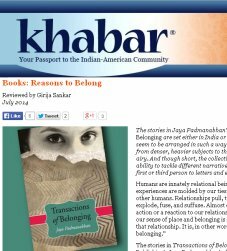 Are the stories in your collection organized around the theme of belonging? Yes, in this collection I tried to examine the give and take of belonging—the transactions we enter into, the compromises we make, the filters we use to justify our beliefs. In one of the stories-"The Blue Arc"-a woman trapped in the brothels of Calcutta cultivates a relationship with a neighbor as her reason to belong. In another one, a young boy searches the reason for his alienation. The emotional ups and downs in the stories are part of the journey that I take the reader on. When I hear the title of your collection, I not only think of belonging, but also the things that stand in the way of belonging-displacement or dislocation. Where do these stories take place? Great question. True, many are about displacement. Characters in the collection find themselves in unfamiliar locales and novel relationships. I have tried to get at how we as individuals attempt to interpret our encounters to shape our experiences. The geographic boundaries that the characters inhabit are incidental. Some are in India and some are in the U.S. The story "His Curls" is free of geographical boundaries and hence can be placed or displaced anywhere. When did you start working on this collection? Also, related, you've worked in many different capacities - have any of your day jobs influenced your work? I've worked on the collection for over three years. Each one of my jobs exposed me to untold stories and narratives waiting to be written. I have always been a writer-in-waiting and all these other jobs, whether as a mother, a collections agent or as a software engineer, presented a worldview, a perspective, that I would never have been privy to otherwise. Do you have a favorite story in the collection? What is it about? I think I'd like to answer that by talking about the story I had the most tumultuous relationship with. The story "His Curls" is the first short story I wrote and I spent over three years debating what the ending should be. Finally I left it ambiguous. The story is about a mother who suspects her son is a terrorist. The story's ending can be shaped depending on how the reader views the world around him/her. Finally, I found that the ending settled into place as an engagement with the reader. Agonizing about the story taught me that every story did not need to be tied into a neat knot. The beginning, ending and even the middle can be as troubling as the interior world the characters inhabit. Which authors do you see as influences for your fiction writing? This is one of the most complicated questions to answer. I have favorite writers for different moods. I like Rohinton Mistry for his compassionate voice; V.S. Naipaul for his brilliant modulation; Toni Morrison for her spare, stark prose; J.D. Salinger for the timelessness of his tale; Margaret Atwood for her inventiveness; Vladimir Nabokov for writing the most startlingly perfect multi-dimensional novel: Pale Fire, and the list goes on. Has your work with India Currents first as a writer and later as managing editor impacted the kinds of stories you're interested in telling? Working for a magazine like India Currents has taught me the beauty of moderation and the power of interrogation. It's been an incredible learning experience. Mostly, I am humbled by the talent I've encountered, the beautiful voices I've worked with, including this interviewer's. The stories I'd like to tell today are the ones I encounter in my everyday, the environment I live, love and work in. I'm working on a novel titled The Eleventh Letter. It's been in the works for close to four years. It has some of the characters that you'll meet in one of the short stories.